MAUSTON — The Menomonie baseball team earned a trio of victories at the Woodside Sports complex this past week, defeating Hayward 2-1 and Stoughton 8-4 on Friday before capping the unbeaten performance with a 13-3 win over Black River Falls on Saturday. Davis Barthen and Kade Schultz each had a hit for Menomonie in the one-run win over the Hurricanes with Sam Sleichert driving in one run. Jake Ebert and Sleichert were strong on the mound in the win as Ebert struck out seven while allowing one run in six innings and Sleichert pitched a scoreless seventh with two strikeouts. 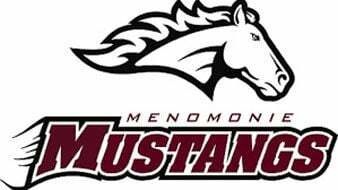 The bats came alive for the Mustangs against Stoughton as Menomonie had 12 hits and drew 10 walks in the win. Jace Kressin was 3-for-4 with a run batted in while the trio of Sleichert, Schultz and Kaleb Miller had two hits apiece with Schultz and Miller each driving in a pair. Menomonie scored three runs in the third and four in the fourth to break the game open. Sleichert picked up the win in the second game as well, allowing one earned run in 5.1 innings to go with 11 strikeouts. Miller had three of his team’s 12 hits and drove in two as Menomonie defeated the Tigers by 10 in the final game of the weekend. Briggs Richartz drove in three, Sleichert, Ebert and Zach DeMarce each had two hits and Miller also plated a pair. Richartz and Sleichert tripled while Ebert had a pair of doubles. Barthen delivered a quality start on the mound, allowing three earned runs in six innings while striking out five. At Durand, Zac Rindy had two hits but the Vikings were blanked by Durand. Rindy was 2 of 3 with a stolen base for the Vikings (0-2) as the Panthers scored one run in the first and four in the second to take an early lead they wouldn’t relinquish. Blaine Bauer and Preston Milliren each had two hits for the Panthers while Durand drew 14 walks in the win.